Microsoft Skype for Business is a communication and collaboration tool that lets you use your computer or mobile device to instant message, video-chat, have ad-hoc or scheduled online video meetings/webinars, share screen and content with other students and staff at UNE. Please note - known as Lync if you are a Mac user. Sign-in to Skype for Business using your full UNE email address as the sign-in address. Open the Skype for Business 2015 application from the Start menu. (Mac users should search for Lync in Spotlight). Enter the Sign in address: as your full UNE email address: username@myune.edu.au. 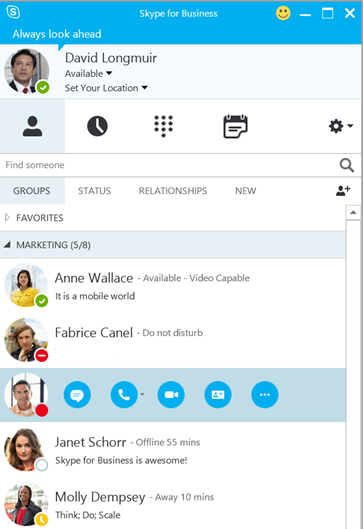 To use Skype for Business, you need an internet-connected device with Skype for Business installed. To use the video calling features, you will need a camera-enabled device (webcam on desktops or laptops, or in-built camera on tablets and smartphones) and a Skype compatible headset (with both earphones and microphone). For personal or home use on a Windows PC, Skype for Business is part of Microsoft Office Pro Plus (UNE's student license) or any other installation of Microsoft Office. If you already downloaded Microsoft Office via your UNE email account or have a subscription to a personal version of Office 365, you will already have the Skype for Business (SfB) client installed as part of Office. If you don’t have Microsoft Office installed, you can download the entire Office Suite, including Skype for Business free of charge as a UNE student. This installation includes Outlook, Word, Excel, PowerPoint and other Microsoft Office Applications. Note: Once installed, you can find the Skype for Business software in the "All Programs" -> "Microsoft Office" folder. Once complete, click Close To make your changes take effect, exit and restart any open programs. Check in Programs -> Microsoft Office 2010 to see if Skype for Business is already installed download a standalone “Lync Basic” client from Microsoft's website, which will automatically update to the latest Skype for Business client as part of your Microsoft updates. If you don't have the Lync client pre-installed, you can download it from Microsoft's website as a standalone client. There is no native SfB client for Linux, but some 3rd party applications allow for basic functionality on Linux. Skype for Business is also available for mobile devices, search for and install the client from the relevant apps store for your device and use the login details below to sign in. Search for Skype For Business. Locate Skype for Business for iPad and tap Get. If prompted for your iTunes password enter it now and click OK. Note: You may be asked to sign-in using your Microsoft ID. More information on the mobile apps (including training and help guides) can be found on Microsoft's support pages. What is the difference between Skype and Skype for Business? Skype and Skype for Business are two separate products with similar features. You will not be able to use SFB to make phone calls to friends or family that are not also set up on Skype for Business. Our recommendation is to keep the two products separate. Can I make phone calls to friends and family outside of UNE? How do I search for a contact in the address book? To find a contact in the address book, please enter the full email address of the person you would like to contact. When I try to Join the Meeting, Google Chrome asks me to install a web app. What is this? If Google Chrome is set as the default browser, clicking a "Join the Meeting" calendar invite will not open the SFB client on your computer, but instead try to download the WebApp. This is a known issue. The only known workaround and change the default browser to Internet Explorer or Firefox. My audio or video isn't working. What can I do? Have a look at the Audio / Video Settings quick start guide to review your setup.